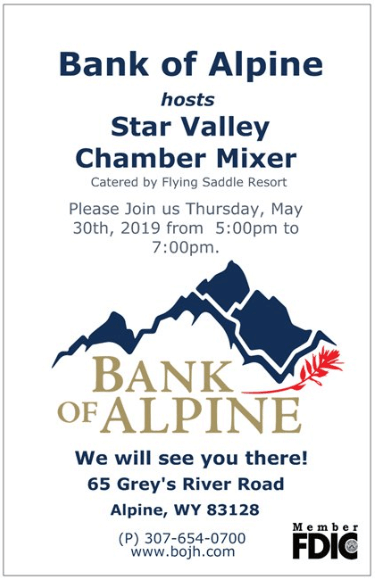 Bank of Alpine will host SV Chamber Business After Hours May 30 from 5-7 p.m.
Bank of Alpine representative and SVP, Commercial Lender, Scott Thomas, has invited several organizations to this event in hopes to unify the upper and lower valleys. “My hope is to bridge both social and economic gaps between the two areas,” Thomas said. Bank of Alpine has been a member of the SV Chamber of Commerce since it first opened in the spring of 2008. Thomas said one benefit the bank receives is business networking the Chamber provides. Thomas said customer service is always number one for Bank of Alpine, and other related branches. Thomas invites all to attend the Business After Hours which will be held at Bank of Alpine. Flying Saddle Resort is also catering the event. “I believe that this kind of mingling can be beneficial to everyone in the community,” Thomas said. Fairfield Inn & Suites, Why Do Guests Love it Here?